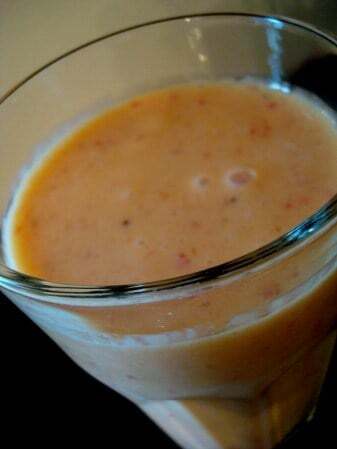 This is my take on a traditional Indian drink: a mango lassi. 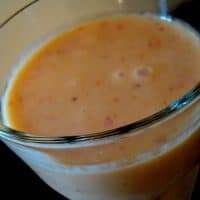 Creamy, light, fruity – this better-than-a-smoothie concoction is absolutely delicious and I make it every time I find ripe mangoes at a good price. It probably goes without saying that my kids (and husband) slurp this up like it is nobody’s business. Tanya – sure, but I’d probably add another mango to the mix to make up for the lack of strawberries. Can we use choose to not use strawberries. I absolutely despise them when mixed in drinks! Okay, I tried this recipe and loved it. When my husband tried it he asked if he could have two wives… you being the second. I said I would mention it 😉 J/K but seriously, thank you for posting this recipe!! I can’t believe my eyes. As a family we always order at least one mango lassi when we eat at the Bombay House in Provo. Thanks for this divine recipe! Yum Yum! I always made this without strawberries. I tries it with them after seeing this recipe…its definitely a nice addition! I had no idea this was a traditional Indian drink. I LOVE magoes and I love smoothies with yogurt. I will definitely have to try this! I saw the link to your cooking blog on Jed and Erin’s blog. I love cooking too so I can’t wait to try some of your delicious recipes! Mmmm, there’s nothing like yummy food to put a smile on my face! YUM!!! MY boys LOVE smoothies! We have them several times a week–just trying to get more fruits and veggies in them! I am defiently going to try this! It looks so delicious! I’m a new convert to mangoes. I ahd never even had a fresh one until last year. This sounds tasty!